Just what the Doctor ordered ... > Worldview > What path are you on? Having seen the movie Ender’s Game for a second time now, I have to stop and think about what role we play in our own world: Colonel Graff or Ender Wiggin? This isn’t the kind of movie where there is a clear-cut hero or villain, oppressor or victim. It’s all about perspective and shades of gray. Col Graff’s worldview is centered on “it’s us or them — if we don’t take out the enemy first, they’ll come back and destroy us.” As someone who survived the failed attack on Earth 50 years before, it would be a reasonable fear motivation … or would that be revenge? He, and the leadership of the International Fleet, are doing whatever they think is necessary to achieve this objective — the end justifies the means. When pressed with the question “do the ends justify the means?”, most of us would quickly say “no!” … but in reality are we pursuing our own personal objectives with such tunnel vision that we cannot (or choose to not) see the results other than as progress to our goal? For example, how many people do we talk with just to further our own agenda? In the business world, it’s called “networking” … everyone knows it’s artificial, yet it’s the way business works. 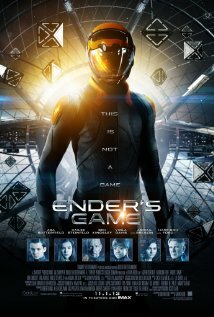 Ender Wiggin, on the other hand, is a product of his society … or is he? His birth as the third child in his family took a lot of special effort (we won’t talk about the validity of a 2-child only rule in society). His parents wanted their children to be successful in “the program”, and his older siblings had washed out. After demonstrating significant talent in his studies, he was pushed in calculated ways to develop skills that would serve him as a commander. There are those that would say that we are all “products of our environment” … conditioned to respond in certain ways, whether positive or negative. Our families train us to respond; our jobs, too. Even the church trains us to respond. What is the result of all this conditioning? Are we truly locked into whatever it is we are programmed for? Ender Wiggin woke up to his conditioning (too late, some would say) and started forging his own way. We need to follow the path He blazed for us — breaking the traditions of the pharisees, who had a very narrow view of reality … and waking people up from their dogmatic following of the society they were in. We need to be like Ender at the end of the story: following our conscience and doing what is right … wherever that takes us.